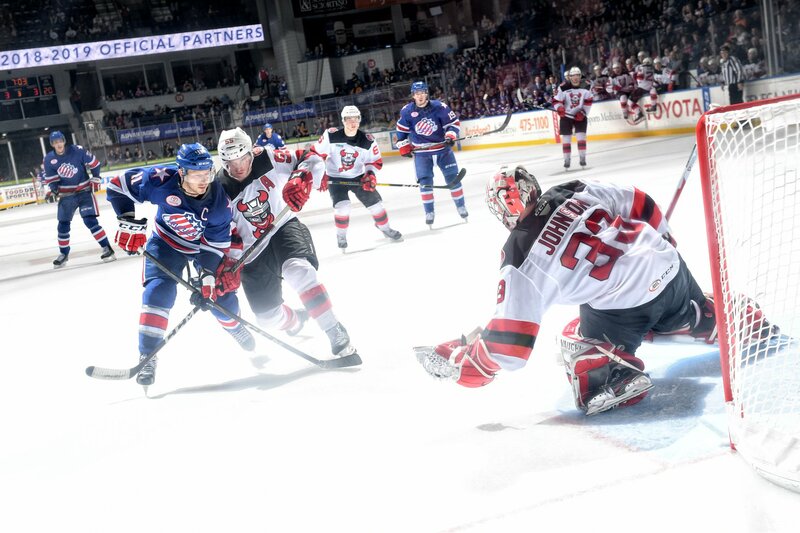 Overtime Loss Raises Questions About Home Ice · Let's Go Amerks! The Rochester Americans have talked about winning the North Division title all season and Friday night that opportunity likely slipped away from them on home ice. Again. A path to winning the division title was simple – win three straight and it’s theirs. But yet again they played a bad game on home ice in front of a big crowd. The end result was a 4-3 loss in overtime to the Binghamton Devils – a team that was eliminated from the playoffs a long time ago. The playoffs start in a week. Based on the way this season has gone the Amerks play a bad game Friday night followed by an impressive bounce back game Saturday night. I’ve talked to Chris Taylor enough to know he’s genuine when he says that it’s disappointing and he’s upset about it. That doesn’t change the results of the game but it’s not him simply saying the right things. There’s a scenario where the Amerks can still win the North Division but the concern will remain that they play poorly on home ice. Zach Redmond wasn’t concerned this week when I asked him about the home ice record saying the playoffs are a new season. You could say that Danny O’Regan was slashed on a short handed breakaway in overtime. You could say there was a line change that should have resulted in too many men against Binghamton. A Binghamton Devils skater was definitely off sides before they scored the overtime winning goal. There are no challengers in the American League. If the Amerks had played better in the second period those things wouldn’t have mattered. After a slow start to the game the Amerks showed life in the last five minutes of the first period fueled by goals from Will Borgen and Victor Olofsson. Will Borgen shot from the side wall, the puck hit the back wall, and it went in off the back skate of Binghamton Devils goalie Cam Johnson. Kurt Gosselin earned his first professional point with an assist on the goal. Just over two minutes later Victor Olofsson scored his 28th goal of the season with assists to Kyle Criscuolo and Will Borgen. A text book play with Borgen getting the puck to Criscuolo, and then Criscuolo spotted Olofsson breaking out and delivered a perfect pass. Olofsson went back hand and scores almost every time on that move. And then that second period happened. Brandon Baddock floated a puck at the end that beat Wilcox glove side. Just 19 seconds later Brett Seney was able to slip past the defense and beat Wilcox glove side. Eric Tangradi found a loose puck in front of the net and scored a power play goal with 5:45 left in the second period to give the Devils a 3-2 lead. The Amerks may have caught a break in the third period when Rasmus Asplund scored to tie the game at three just 1:55 into the period. The score sheet has it listed as a power play goal. The Devils penalty was called at 19:49 of the second period. The math doesn’t add up. Danny O’Regan and Taylor Leier had worked the puck on the boards, Leier sent a centering pass to Asplund in front of the net and he scored his 10th goal of the season. There were breakaways in the game, there were shots that went wide, and there were passes instead of shots. Everything goes back to the first goal against that Wilcox would like to have back. That’s when the wheels fell off. This team has come back from deficits before to help their goalie out but that didn’t happen this time. In overtime Taylor Leier was called for tripping with 1:48 left on the clock. His stick was between the legs of Ryan Murphy. Eric Gryba took a shot from the blue line in overtime, Wilcox made the initial save, Nathan Bastian picked up the loose puck and scored. There are no off sides challenges in the American League. It was a good goal and Binghamton won. Maybe winning the division title wasn’t as important as some made it seem. And then you lose and over eight thousand fans in attendance are disappointed again. After 38 regular season home games the Amerks finished with 21 wins and 17 losses (21-14-2-1). On the road the Amerks have 24 wins and 12 losses (24-8-3-1) with two games remaining. On a season level they’re only three points out of the division title going into the last two games of the season. They’ve been a top five team all season. There’s a lingering question, is home ice a disadvantage going into the playoffs? We’ll find out next Friday when the first round starts.